Luxury at a Great Price This mattress is pure luxury at a price that makes sense. 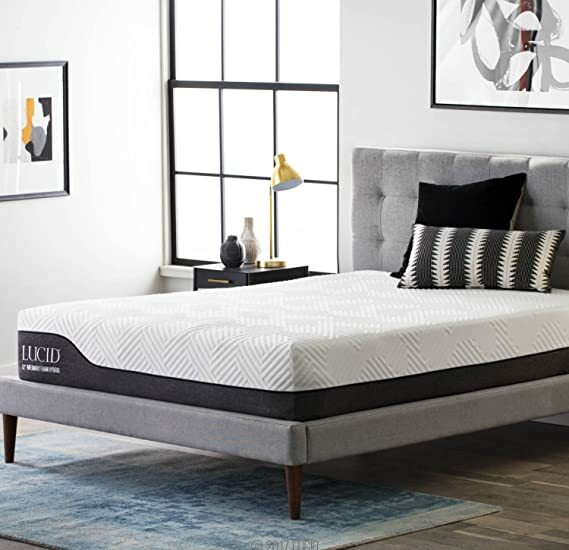 The 12-inch thick mattress features a 3-inch layer of gel-infused memory foam, a 1-inch layer of bamboo charcoal memory, and an 8-inch high-density foam base. The result is a supportive mattress with a medium feel and has a 4 pound foam density. The Comfort of Gel Memory FoamThe LUCID gel memory foam formula infused with gel beads to capture and distribute heat. A ventilated design increases airflow throughout the sleep layer and helps regulate sleeping temperature. The memory foam quickly conforms to weight and pressure and isolates motion transfer between sleeping partners. This mattress correctly aligns the spine and helps relieve pain by supporting the natural curves of your head, neck and shoulders. Open cell construction yields a longer lasting, more resilient foam that will not leave long-lasting body impressions. Our memory foam is naturally resistant to allergens and dust mites.Convenient Shipping and Setup LUCID mattresses are compressed, rolled and packaged in a box for easy shipping and convenient set up. Place the box in the room where the mattress will live, carefully open the packaging and your product will expand. During extreme cold, we suggest you lay the mattress flat in a warm room and allow extra time for expansion if needed.Peace of Mind The 10-year warranty provides increased peace of mind for your purchase. This mattress does not contain synthetic or natural latex of any kind. All of our mattresses are manufactured to industry standard dimensions for easy bedding purchases and application. 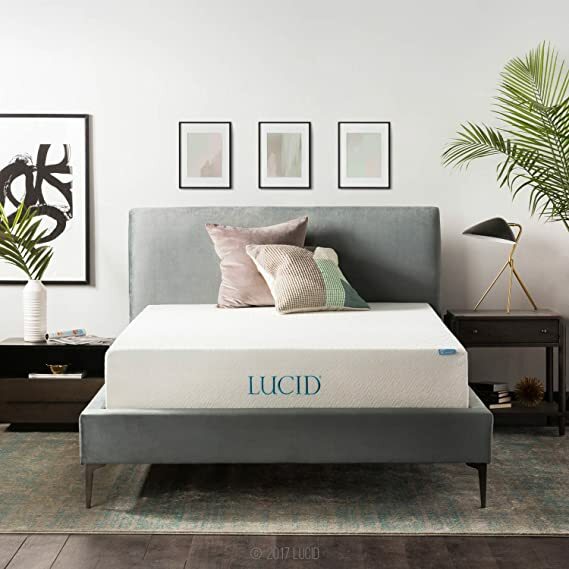 Our new Lucid 12 inch latex Hybrid combines the support of coils, the sink of memory foam, and the bounce of latex for the ultimate luxury sleep experience. This high-profile Hybrid provides the coziness of memory foam with the added spring and temperature-neutral support of latex. This medium-firm mattress is supported by a 6.5-Inch, individually-encased steel coil base sandwiched in foam for greater edge support and motion isolation, so you and your partner can sleep without interruption all night long. Topped with a two-tone, circular knit fabric cover, this durable mattress is protected by a 10-year warranty against manufacturer defects and will be part of the family for years to come. Give your sleep a clean and fresh feel with the new LUCID 12 Inch Bamboo Charcoal and Aloe Vera Hybrid Mattress. 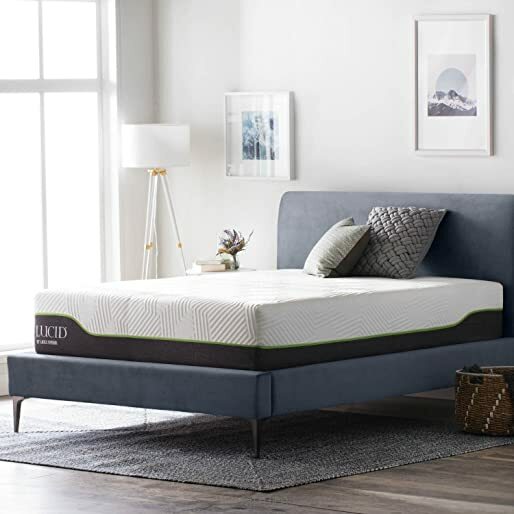 This hybrid features an individually-encased coil base made of high-gauge steel, a 1.5-inch layer of transition foam infused with aloe vera, and another 2-inch layer of memory foam infused with bamboo charcoal. These natural infusions regulate moisture and combat odors, so you wake up rejuvenated in the morning. This mattress packs all the comfort memory foam has to offer with the added support and durability of coil springs for the ultimate sleep experience. Complete with a two-tone circular knit fabric cover and protected by a 10-year warranty against manufacturer defects, this mattress is the perfect addition to any guest room or master bedroom. 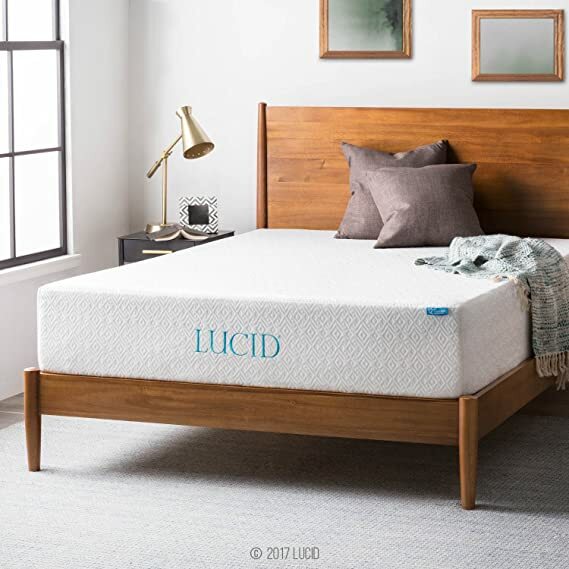 Sleep cooler and enjoy greater pressure relief with our new LUCID 12-Inch Latex Hybrid mattress. By combining supportive coils, plush memory foam, and responsive latex, weve compiled all the best materials to form the luxury sleep dream team. The perfect mattress for those who are hesitant to purchase a 100-percent memory foam mattress. This medium-firm mattress is supported by a 6.5-inch, individually-encased steel coil base sandwiched in foam for greater edge support and motion isolation, so you and your partner can sleep without interruption all night long. Topped with a two-tone, circular knit fabric cover, this durable mattress is protected by a 10-year warranty against manufacturer defects and will be part of the family for years to come.